I was thinking recently about my first memory relating to the Great War. It took a while but I came to the conclusion it was watching the Australian mini-series ANZACs. This would’ve been late 1985 or so, assuming I watched it when it was first shown on British TV. Depending on when during the year it was shown, I think it was Christmas time, I would’ve been 8 or 9, probably 9. I strongly remember a scene where an Officer arrives at the ANZACs stretch of trench and notices there’s an informal truce going on and orders that trench mortars are fired into the enemy lines. All hell breaks loose and both sides start blasting the blazes out of each other. I’ve re-watched ANZACs recently and the scene was pretty much exactly how I remembered it from 29 years ago. I’ll review that at some point. Whilst watching today’s film I remembered there was something prior to ANZACs that piqued my interest and was probably the reason why the nine year old me was watching ANZACs in the first place. I just googled it to check and I was right. For the first time since 1983, 31 years ago, I’ve just watched the video for Paul McCartney’s Pipes of Peace. Again, it was as if I’d only watched it yesterday. Click here to check it out yourself if you feel the need. The video portrays the story of the 1914 Christmas Truce (in reality ‘Truces’, as they occurred up and down the line that Christmas). I remember the 7 year old me being intrigued by the enemies playing football together and shaking hands in No Man’s Land. I was hooked. I can’t think of any other single incident that occurred during the Great War that has the same resonance and has passed into folklore in the same way as the 1914 Christmas Truce. In one simple incident it reminds us of the futility of the entrenched stalemate and how the soldiers, normal human beings on all sides, drew parallels between themselves and their foes, had a grudging respect for them and knew that they too were suffering in the inhumane conditions. My film today is a snapshot of that day, Joyeux Noel (2005). It’s worthy of note that the film is an international production with money coming from Germany, France, the UK, Romania and Belgium. Can you imagine how the soldiers of the time might’ve reacted to that knowledge? Would they have been proud that their suffering was not in vain? Or would the idea of such fraternisation with the enemy have filled them with even more hatred and disbelief in their cause? We basically have three stories here. 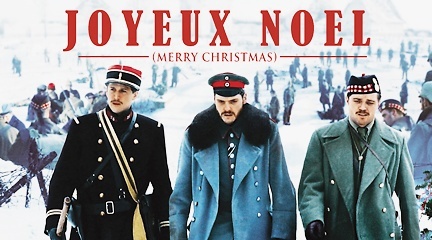 A French Poilu and his Batman struggling to forget happier times, a Scottish lad, his dead brother and their padre coming to terms with stiff military discipline and arbitrary death and a German couple, professional singers, who’s love cannot be restrained by barbed wire and military rule. Good, varied and diverse real world issues for the soldiers of the time. There’s the basics of the plot right there. It’s well researched and moves at a good pace. It doesn’t get bogged down in the logistics of war or the movements of the individuals and due to the diverse nature of the story-lines it flits from one snapshot of daily life in the build up to Christmas Day 1914 to another. It feels slick and well put together. It’s not bombastic. The battle scenes are small scale and certainly not a focal point. It’s a character piece and the interactions between the various protagonists are well-paced and poignant. It does have problems though. It’s a two hour film and the first 80 or so minutes are all build up. Nothing much happens for pretty much all of the movie. Is this a problem? Not in itself, but it does mean that what is happening has to be well executed. In this case they just about pull it off. Another issue is that when stuff does start to happen it gets a bit silly, and then the most likeable character gets killed. It suddenly all feels a little bit rushed and disjointed after setting itself up as a thoughtful plodder. One final grumble is that the German opera singers are so badly dubbed it’s like watching Milli Vanilli singing Ave Maria. Ave Manilli….maybe. Even when they’re fraternizing with each other in No Man’s Land you don’t get the sense that they’re really in the lawless, stinking mire that it surely would’ve been. I’m not asking for gore here, just a nod to the reality of the situation. 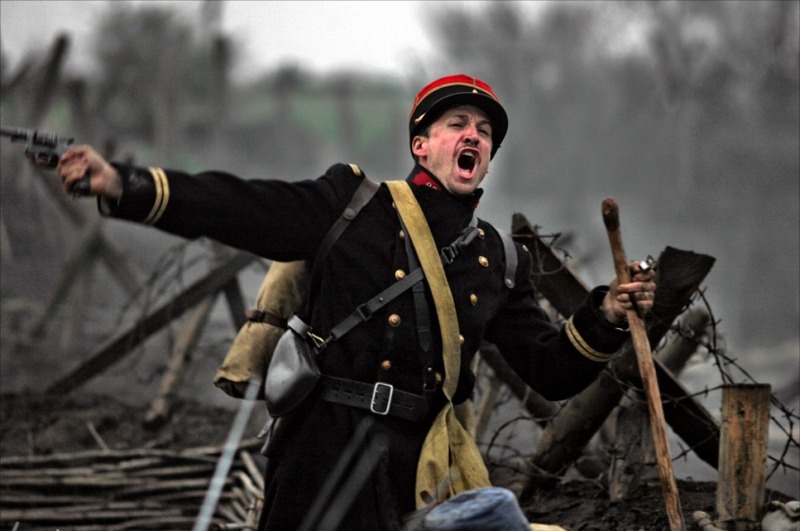 The cinematography and writing have made an obvious decision to not focus on the death but rather engage with the characters and life in the trenches. This trade-off between reality and sanitized Hollywood story telling is something that can ruin a film. Somehow, and I don’t know how, they pull it off….just. It is sickly sweet at times but it’s a Christmas film as well and if there’s any time of the year where you can get away with sentimentality it’s at Christmas. There’s singing and a sermon, there’s sharing of drinks and photos. It’s all Christmassy and I don’t mind. There is a bit of anti-war sentiment towards the end with a religious service sowing hatred for the enemy and then the various troops get sent on their way to other battles. The French to the meatgrinder of Verdun and the Germans to the Eastern Front. These guys I’ve grown to like during the past two hours will most likely be dead within weeks. Overall, it’s a good film. I’ve watched it several times and haven’t tired of yet. It tries to pull at the heart strings and maybe just about succeeds. The characters are real enough and the camera work and direction stick to the story of the truce and don’t digress into the wider conflict. It swings from slow paced interactions on a human level to a bit of a rush job quirky comedy, to over the top sentimentality and then finishes with some strong anti-war themes. So, it’s a bit all over the shop but I don’t care. I like it, I’ll watch it again, and I advise you to as well. Clicky Clicky right here to get your copy.